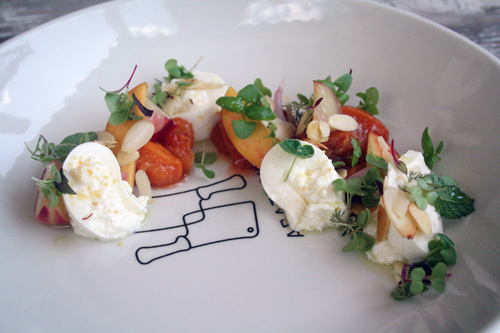 Tyler prepared peaches three ways; pickled, stewed and fresh. 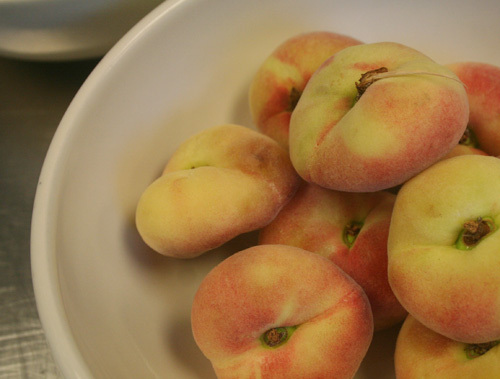 To make the pickled peaches, quarter 6 doughnut peaches. (these peaches offer a nice contrast to the sweet peach as they are a bit firmer, plus as Tyler says, "they're small and pretty.") Combine 1/2 cup rice wine vinegar in a pan with 2t sugar and 1t salt. Heat until the salt and sugar are dissolved. Cool liquid, then cover peaches. Let sit overnight. 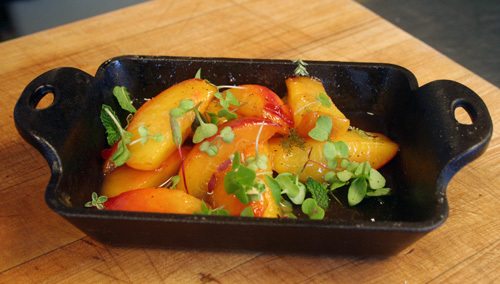 After tasting these stewed peaches of Tyler, I want to try these at home myself. They're amazingly delicious- just be sure you don't cook them too long as they just need a light touch. To make, quarter four Georgia or South Carolina peaches (Tyler recommends Ruby Prince peaches for their nice balance of sweetness and acidity) and combine with 1T of butter in a pan. Cook for a minute or two over medium heat. Add remaining ingredients (1T honey, pinch of saffron, 1T rice wine vinegar, pinch of salt) and reduce until glazed. 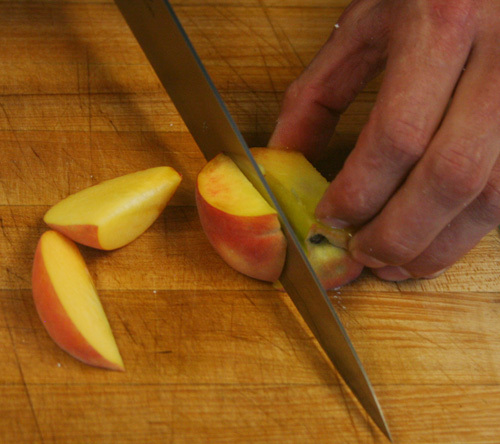 I think this was my favorite preparation of peaches as it really enhanced the sweetness and made me want to lick my spoon, the bowl, the pan... Tyler warns against oversweetening as the peaches need very little to bring out their natural flavor. 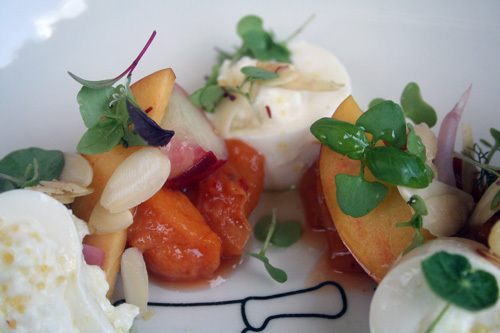 To assemble the dish, spoon stewed peaches onto plate. 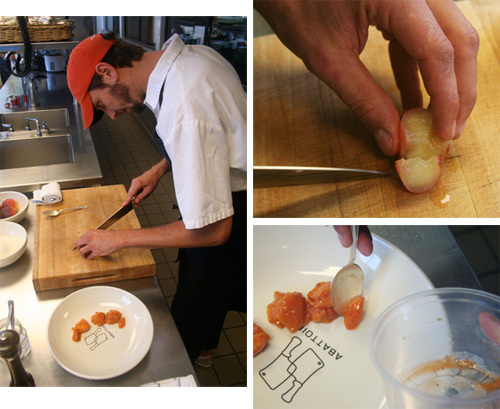 Add the pickled and fresh peaches on top in a pretty way... Tyler is the master at this. Cut fresh Buffalo mozzarella into bite size pieces. Scatter with micro basil, almonds, (Tyler used toasted blanched and sliced almonds which plays off the natural almond flavor of the pit) and drizzle lemon infused olive oil on top. And there you have it, Peaches and 'Cream,' a beautiful seasonal dish you'll love to eat as much as share it with friends and family. Tyler believes this is a great appetizer for a BBQ dish. As he shared, "Serve something grilled with it like a nice grilled pork." It's a dish that takes a little time to prepare but is well worth the effort. 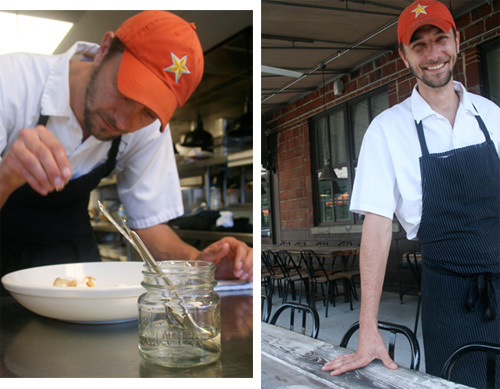 And if you're in Atlanta, go visit Tyler at Abattoir...and try the pork belly!